We continue the journey of catechesis on "Our Father", which began last week. Jesus puts on the lips of his disciples a short, bold prayer, made up of seven questions - a number that in the Bible is not accidental, indicates fullness. I say boldly because, if Christ had not suggested it, probably none of us - indeed, none of the most famous theologians - would dare to pray to God in this way. In fact, Jesus invites his disciples to approach God and to ask him some questions with confidence: first of all concerning Him and then concerning us. There are no preambles in the "Our Father". Jesus does not teach formulas to "ingratiate himself" with the Lord; on the contrary, he invites them to pray to him, dropping the barriers of subjection and fear. 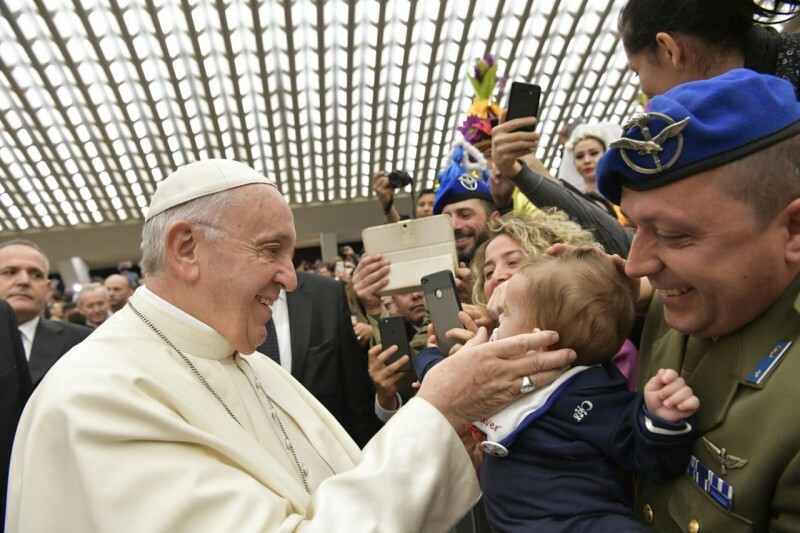 He does not say to turn to God calling him "Almighty", "Most High", "You, who are so far from us, I am a miserable": no, he does not say so, but simply "Father", with all simplicity, like children they turn to their father. And this word "Father" expresses confidence and filial trust. The prayer of the "Our Father" has its roots in the concrete reality of man. For example, he makes us ask for bread, the daily bread: simple but essential request, which says that faith is not a "decorative" issue, detached from life, which intervenes when all other needs have been met. If anything, prayer begins with life itself. Prayer - Jesus teaches us - does not begin in human existence after the stomach is full: rather it lurks wherever there is a man, any man who is hungry, who cries, who struggles, who suffers and wonders "why ". Our first prayer, in a sense, was the wail that accompanied the first breath. In that newborn cry, the destiny of our whole life was announced: our continual hunger, our continuous thirst, our search for happiness. Jesus, in prayer, does not want to extinguish the human, he does not want to anaesthetize him. He does not want us to dampen the questions and requests by learning to bear everything. Instead, he wants all suffering, every disquiet, to rush towards the sky and become dialogue. Having faith, a person said, is a habit of shouting. We should all be like the Bartimaeus of the Gospel (cf. Mk 10: 46-52) - we recall that passage of the Gospel, Bartimaeus, the son of Timaeus - that blind man who was begging at Jericho. Around him he had so many good people who told him to keep quiet: "But shut up! The Lord passes by. Shut up. Do not disturb. The Master has a lot to do; do not disturb it. You are annoying with your screams. Do not disturb". But he did not listen to those advice: with holy insistence, he demanded that his miserable condition could finally meet Jesus. And he shouted louder! And the polite people: "But no, it's the Master, please! Make a bad impression! ". And he cried out because he wanted to see, he wanted to be healed: "Jesus, have mercy on me!" (V. 47). Jesus gives him back his sight, and tells him: "Your faith has saved you" (v.52), as if to explain that the decisive thing for his recovery was that prayer, that invocation shouted with faith, stronger than " common sense "of so many people who wanted to silence him. Prayer not only precedes salvation, but somehow already contains it, because it frees us from the desperation of those who do not believe in a way out of so many unbearable situations. Of course, believers also feel the need to praise God. The Gospels bring back to us the exclamation of joy that breaks out from the heart of Jesus, full of amazement with gratitude to the Father (cf. Mt 11: 25-27). The early Christians even felt the need to add to the text of the "Our Father" a doxology: "Because you are the power and the glory throughout the centuries" (Didache, 8, 2). But none of us is obliged to embrace the theory that someone in the past has advanced, that is, prayer of question is a weak form of faith, whereas the most authentic prayer would be pure praise, that which seeks God without the burden of any request . No, this is not true. The prayer of question is authentic, it is spontaneous, it is an act of faith in God who is the Father, who is good, who is omnipotent. It is an act of faith in me, that I am small, sinful, needy. And this is why prayer, to ask for something, is very noble. God is the Father who has immense compassion for us, and wants his children to speak to him without fear, directly calling him "Father"; or in difficulty saying: "But Lord, what have you done to me?". That's why we can tell everything about it, even the things that in our life remain distorted and incomprehensible. And he promised us that he would be with us forever, until the last days we spend on this earth. Let us pray to our Father, thus beginning, simply: "Father" or "Dad". And He understands us and loves us so much. Je salue cordialement les pèlerins de langue française, en particulier les jeunes venus de Quimper. Alors que nous nous préparons à fêter la venue du Seigneur parmi nous, ne craignons pas, frères et sœurs, de nous adresser à Dieu avec confiance dans toutes les circonstances de notre vie quotidienne. Nous sommes ses enfants, et il nous a promis d’être avec nous, tous les jours jusqu’à la fin de notre vie. Que Dieu vous bénisse. Herzlich heiße ich die Pilger deutscher Sprache willkommen. Besonders grüße ich die Delegation der Österreichischen Parlamentarier, die anlässlich des 200-Jahr-Jubiläums des Weihnachtsliedes „Stille Nacht“ gekommen sind. In seiner tiefen Schlichtheit lässt uns dieses Lied das Geschehen der Heiligen Nacht begreifen. Jesus, der Retter, der in Betlehem geboren wurde, offenbart uns die Liebe Gottes des Vaters. Ihm wollen wir unser ganzes Leben anvertrauen. Gesegnete Adventszeit euch allen. Uma cordial saudação aos peregrinos de língua portuguesa, particularmente aos fiéis de Braga, Nova Oeiras, São Julião da Barra e aos membros da Orquestra Sinfônica da Universidade Federal do Rio Grande do Norte, de coração desejo a todos um tempo do Advento cheio de luz, pedindo à Virgem Maria, Mãe de Deus e da Igreja, para ser a estrela que protege a vida das vossas famílias. Que Deus vos abençoe! Pozdrawiam serdecznie pielgrzymów polskich. Matce Bożej z Guadalupe, której wspomnienie dzisiaj obchodzimy, zawierzam was tu obecnych, wasze rodziny, a szczególnie te, które oczekują narodzin dziecka. Święty Jan Paweł II powierzył Jej macierzyńskiej trosce życie i niewinność dzieci, zwłaszcza tych, którym zagraża niebezpieczeństwo śmierci, zanim się narodzą. Madonna z Guadalupe – widać, że jest brzemienna: oczekuje Zbawiciela. Za Jej wstawiennictwem, w tym czasie Adwentu, wypraszajmy dar potomstwa dla bezdzietnych rodzin, szacunek dla poczętego życia i otwartość serc na wartości ewangeliczne. Niech będzie pochwalony Jezus Chrystus. I am pleased to welcome the pilgrims from the Diocese of Sabina-Poggio Mirteto and the parish groups, in particular those of Apice and of Perito. I greet the group "Chaminade" of Campobasso, accompanied by the Archbishop, Monsignor Giancarlo Maria Bregantini, the Military of the 2nd Army Aviation Regiment "Sirio", of Lamezia Terme; the Staff of the Police Headquarters of Isernia; the St Petr's Cricket club; the school institutes, in particular that of Altamura, and the group of sick people with Multiple Chemical Sensitivity syndrome. Today in the liturgical celebration of the Blessed Virgin Mary of Guadalupe we ask that you accompany us at Christmas and rekindle in us the desire to welcome with joy the light of her Son Jesus, to make it shine more and more in the night of the world.